Why Would You Need a US Citizenship Waiver? Many people applying to the US for citizenship would like to know if they can get it processed for free using a citizenship waiver. The answer is, in fact, yes as long as you are suffering some form of financial hardship that prevents you from being able to pay all of the related fees. There are many different areas of your application for citizenship that require fees to be paid. What Is a 601 Waiver? Another waiver that you may require is the waiver of inadmissibility to the US. This is required if you have overstayed within the US for more than 180 days to overcome any bars to your return to the country. This is typically applied for after you have left the US and had your interview for your immigrant visa at the relevant consular office. You can also apply for a provisional unlawful presence waiver before you actually leave the US; this has been enacted to prevent close family members being separated from their families within the US for too long. As with all other immigration applications the $930 fee can be waived by you apply for a fee waiver when you make your application by using form i-912. This form and all of your supporting paperwork must be submitted along with your i-601 application form and will not be accepted at a later date. Observe 3 steps for preparing an approvable immigration waiver here. You, your spouse, or the head of the household are in receipt of some form of means-tested benefits such as Medicaid. If your total income is less than 150% of the Federal Poverty Guidelines when you make your application. You have some form of financial hardship that makes it impossible to pay the fees such as unexpected medical bills and other emergencies. If you are struggling to write your essay explaining low GPA, you may find here some useful tips. Applying for citizenship does not involve a single fee. The whole process will require you to submit many different forms during your citizenship application. Many of these fees can be waived through the use of an i-912 waiver request. This will be accompanied by your supporting letter and relevant documentation to support the request. These are just a few of the applications and petitions that you can be required to make. For a full list, you should look at the US Citizenship and Immigration Services website or talk to one of our specialists for citizenship application assistance with US citizenship waiver. Official documentation showing that you are receiving any means-tested benefit. Proof of income for applications based on being below the poverty level figure; IRS 1040. Details of any other financial hardship that you have and the accompanying evidence. Attach an affidavit from a member of your community in good standing to support your request. If evidence is lost you should include the police or fire department report. You can see also what an immigration waiver is, and what else you should know about it. Where Should You Send Your US Citizenship Application Waiver Request? There is no one address that your i-912 should be sent to. The waiver request must be sent through the post not electronically and should be sent to the address listed on the specific form that you are seeking a waiver for. Note that your supporting evidence will not be returned in most cases so be wary of attaching originals. 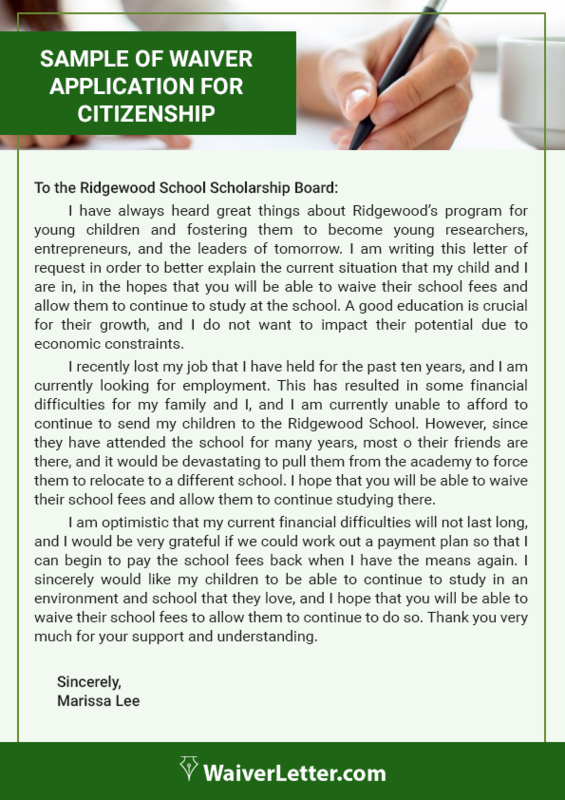 Always use a formal business style format for your letter to present yourself professionally. Begin your letter by clearly stating who you are and that it is a request for a fee waiver. Provide the reader with a clear reason or reasons as to why you require a fee waiver that meets their expectations. Provide them with evidence to support your reasons for claiming a fee waiver. Ours is a highly specialized service that is provided through consultants that fully understand the USCIS process and requirements. They will be able to advise you as to your eligibility and provide you with all of the help with filling out all waiver requests such as i-912 and i-601. We can also help with all supporting letters and with gathering all of the required supporting evidence to support your claims. Our writing service can help you write a persuasive US citizenship waiver letter. Our professional writers have many years of experience with waiver letters. They will write it using adequate language for the occasion. You can be sure that with our writing service, your citizenship application waiver letter will be impeccable. We have a professional editing service to help you edit your US citizenship application waiver letter. Our skilled editors have great attention to detail and will catch any mistakes quickly. They will revise your letter many times. 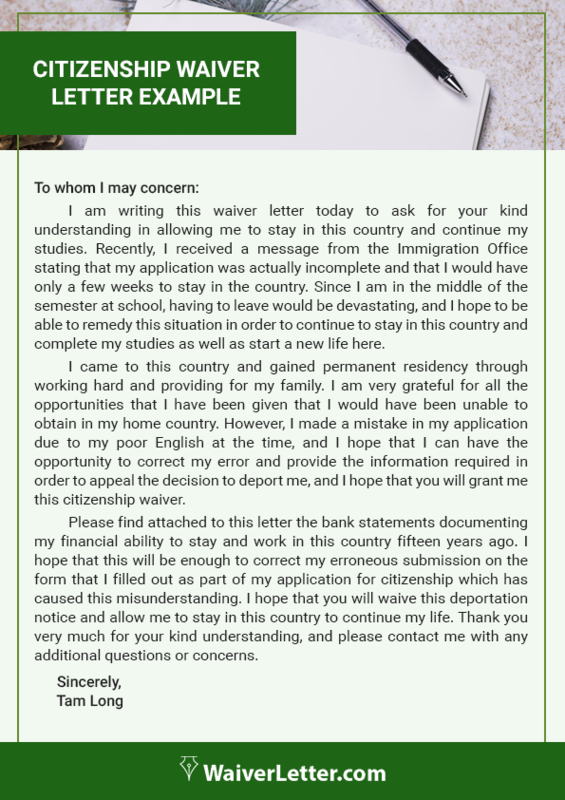 With our editing service, you can send an outstanding letter where you request a waiver application for citizenship. We provide unlimited revisions. We want you to be happy with our work so we will revise your US citizenship waiver letter as many times as you wish. Additional research. If you need us to do some further investigation, we will do it to ensure your citizenship waiver letter is impeccable. Money-back guarantee. We will transfer your money back if you are not satisfied with our work. On-time delivery. You can be sure that we will meet your deadline. Friendly support available 24/7. Our customer support works around the clock to make sure they are available in case you have any problems. If you need professional and reliable help with your citizenship waiver letter just contact our highly qualified and experienced specialists here today! I think it's good enough for me.